While 9/11 and the subsequent rise in terrorism have heightened the security at legislatures across North America, the Alberta Legislature building in Edmonton still maintains it's reputation as a people-friendly place. During the warm months of spring and summer families gather at the "Ledge" to have a picnic and wade through the fountains and pools on the Northside of the building. While security officers are nearby, they don't dampen the family fun. The Alberta Legislature Building was built between 1907 and 1913 in the Beaux Arts style at the same time as the much larger Saskatchewan and Manitoba legislative buildings by architects Allan Merrick Jeffers and Richard Blakey. Montreal architect Percy Nobbs helped with the final revisions. Allan Merrick Jeffers served as the Alberta Provincial Architect from September 1907 to 1910. Jeffers may have been influenced by the State House of Rhode Island, where he had been a student. The style was associated originally with the École des Beaux-Arts in Paris and was fashionable in North America between 1895 and 1920. The use of Greek, Roman, and Egyptian architectural influences was considered appropriate for a public building, as they suggested power, permanence, and tradition. Beaux-Arts buildings are characterized by a large central dome above a spacious rotunda, a symmetrical T-shaped plan, doors and windows decorated with arches or lintels, and a portico supported by massive columns. The dome has terracotta made by Gibbs and Canning of Tamworth, Staffordshire, UK. The building is supported on concrete piles and constructed around a steel skeleton. The first floor is faced with Vancouver Island granite; upper floors feature sandstone from the Glenbow Quarry in Calgary. The interior fittings include imported marble, mahogany, oak, and brass. The building is 55 metres (180 ft) long; the project cost over $2 million at the time. It is located high on the bluffs overlooking the North Saskatchewan River, a few yards from the original Fort Edmonton. Tours are available daily during the summer. 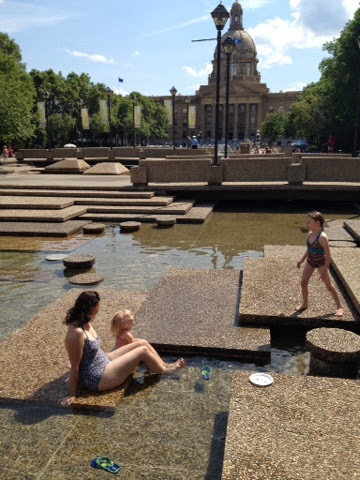 When in Edmonton, take time to visit the Legislature. Bring your swimming suit and plan on two hours to play in the fountains or lounge on the grass and have a picnic. Free two hour parking is nearby. Our family traditionally has eaten tuna macaroni salad and water melon. Cool the macaroni after it is cooked and then add a can of tuna, Miracle Whipe, and celery cut in small pieces. 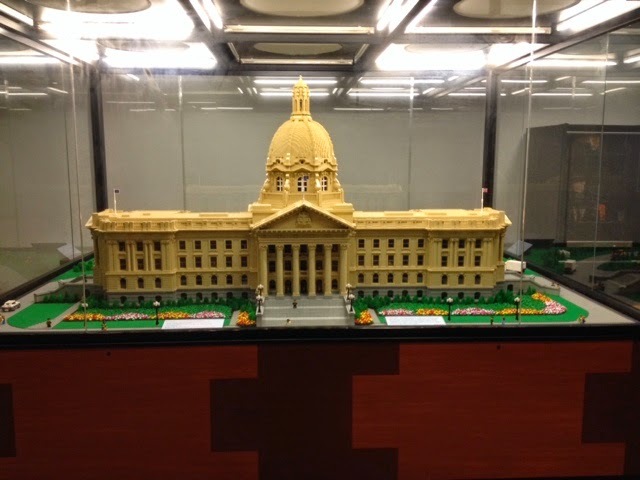 Lego replica of the Alberta Legislature Building has 120,000 pieces including Darth Vader, Harry Potter, and a bride and groom.